There are many models that attempt to quantify effective classroom implementation. I have most frequently turned to the 4C’s in my own district because we believe that Chromebooks are being put to good use when students leverage them to better Communicate, Collaborate, think Critically and express their Creativity. It is easy for educators to put a simple checkbox on the top of daily lesson plans and click off which of the 4C’s the lesson addresses. If it has been a week since students expressed creativity in your class or three days since students collaborated, then the checkbox serves as a reminder to shape your next lesson around those frameworks. Moreover, when employers talk about the traits they are looking for in future employees, they always return to the 4C’s. These concepts resonate with students as well. Many of the other popular models have fallen short in one area or another. SAMR is fine for a snap self-evaluation, but few educators ever talk about their goals to “augment” or “modify”. These words lack meaning. Additionally, SAMR takes a rear-view mirror approach to lesson planning - always comparing the lesson to how it was taught in the past. It is not a framework for creating new or innovative lesson plans. TPACK reiterates that content knowledge (C) and pedagogical knowledge (P) are the foundations of good teaching. Where technology (T) is added to the mix, magic happens in the classroom. This is reassuring. However, like SAMR, it is very teacher-centric. The TIM matrix provides a rubric that pretty well measures the 4C’s. TIM provides more detail than TPACK or SAMR, and talks about what students are doing in a classroom, but the matrix lacks the immediate accessibility needed for wider adoption. Looking ahead, I am excited about the potential of Sonny Magana’s new T3 framework. 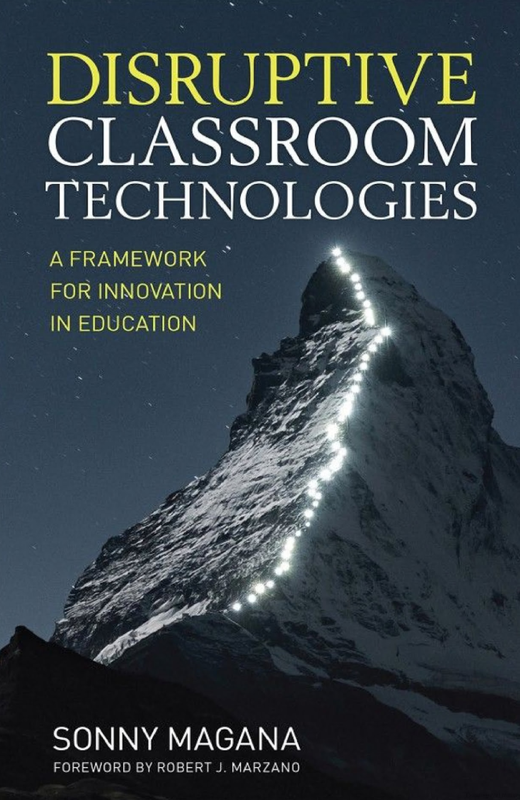 He introduces the model in, Disruptive Classroom Technologies. The book takes on a research approach and is not the most compelling read, but the T3 model and the observation rubrics, self-assessment frameworks and other resources you can access after purchasing the book are very compelling. T3 is student-focused and lays out an actual progression for teachers and students to follow as they improve their own technology integration. Automation Doing things more efficiently or more accurately. Consumption Taking in content, rather than collaborating to create new content yourself. The translational level includes the use of technology to increase efficiency and consume information. It is an important foundation for tech integration. All educators should understand how to leverage technology to increase efficiency and should help students consume information with the aim of increasing knowledge and engagement, rather than distraction. Production Keeping track of one’s own learning goals and creating content to reach those goals. Contribution Creating work that helps others learn or shares with a broader audience. The 4C’s come in at the transformational level. Here, student are producing real work and contributing to a broader audience. They are communicating, collaborating, thinking critically and expressing their creativity with a true sense of agency, meaning that students are identifying their own goals to achieve their objectives. Inquiry Design Solving and then communicating about big problems that matter to you and require complex solutions. Social Entrepreneurship Using digital tools and the design thinking process to build and distribute solutions to big problems. The T3 model really proves its worth at the transcendent level. Students at this level are following their own inquiry … We all know that problem-based learning is profoundly effective, but it is also amazingly time consuming. Here the ownness is on the students to identify their big problem and then collaborate to implement complex solutions. This reminds me of the Bears in Space project the emerged when a small group of brilliant White Bear 9th graders collaborated with a former teacher to form a group with the aim of doing something impactful. Their project quickly evolved into a complex plan to launch a couple of small plastic bears into the stratosphere via weather balloons. While they worked on the logistics, permitting and math, they also talked about how to increase the project’s impact. They decided to film the whole thing and then present each of the recovered bears to educators in our system who are advancing scientific learning in our district. They partnered with a high school AP chemistry class to join their project. Those students devise experiments to launch that tested sound wave differences at various altitudes along with the insulative and impact values of mushroom-root styrofoam. Others in the class paired with a local elementary school to design and test parachutes. Once the project was complete, the group presented to a very impressed School Board and is now working on their next big thing. The Bears in Space project is a perfect example of inquiry design. It also has hints of social entrepreneurship - the last level in the T3 Model. In this highest level, students are using digital tools and the design thinking process to build and distribute solutions to big problems. Real problems in the real world. Outstanding! I have high hopes that pairing the 4C’s with the T3 resources and ideas will help us prioritize student agency and empower our staff and student take learning to a whole new level. Although his research with Hattie does come out after the release of the book, I look forward to hearing more about how they are measuring the very real impact of this model.